Well, I had hoped to do more today, but I just finished the outlines on Stirha Cal-Dron. You will be using Burmilana and Lorikeet for the outlines. A tip is to cut the Lorikeet to the same length as the Burmilana, which is already cut. Make sure you totally stitch around the rocks as they are held together by the "mortar" which you are stitching. I referred to my color copy to stitch around the bird. 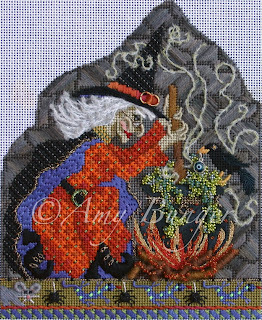 Amy has made it easy for us to stitch basketweave between the caldron and the witch. I can handle that! "One thing I found helpful before I started stitching the rocks, was to kind of map out which ones slant in one direction and which ones in the other, kind of like the roof of the house." "They do go pretty fast and it's fun. Hopefully some of the other parts will be just as quick and easy." You might think I am easily persuaded... perhaps. I have been inspired again by Jane/Chilly Hollow to pull out a canvas from my Stash & stitch along with Jane. In case you aren't following Jane's blog, she is going to be stitching a Kirk & Hamilton Mini-Stocking ornament of a Dog with Candy Cane. I, too, have a Kirk & Hamilton canvas: a Halloween Cat hanging onto a Floating Jack O' Lantern Balloon. I have a story about my canvas. I first met Kirk & Hamilton at the Columbus TNNA Market. My eyes were big, taking in the wonders of the Needlepoint Market. My ears heard lovely male voices with a British accent, and I stopped dead in my tracks. Yes, I am a fool for the accent! I didn't want to look too obvious, so I gazed at the canvases on the wall. 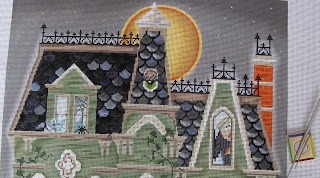 My eyes gravitated towards the Halloween canvases; their needlepoint designs were fresh. With a wee bit of coaxing, Amy purchased the Floating Cat canvas for the store. Then a lovely surprise occurred last November. Jill gave me this Floating Cat canvas for my birthday. I was so thrilled and very anxious to stitch it. However, the voice from my childhood said, "You've got to get your chores done before you can play", and the Floating Cat went into my Stash. Until today! 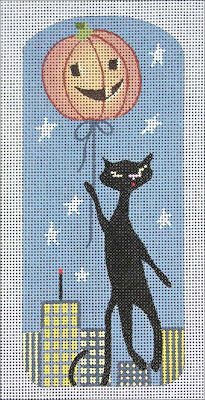 I will stitch & post my progress of the Floating Cat on the Needlepoint Study Hall blog. And again, Jane/Chilly Hollow, I thank you. Lots of you have received your first character canvas. Make sure to make a color copy of the canvas, (for your personal use only), to assist you in placement in the areas where we will "ignore the painted canvas". Then you are ready to add the rock background. Take the time to tape down the template provided and then the canvas on top as you see above. Don't be afraid to use the thick end on the Identi-Pen. Jill has already stitched some of the background and reports it stitches up quickly. After I drew the lines I slipped a piece of white paper between the canvas and the template to check my lines. Once satisfied you may mount your canvas on bars. I have really enjoyed the Evertites and will try to use them on as many characters as I can afford to. Let's start Sunday afternoon, shall we? Katt Z. Witch & Stitch Guide are now available. 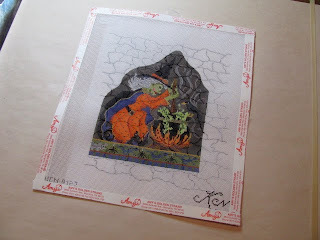 I wanted to let you know the Katt Z. Witch canvases are available through your LNS, and so are the Stitch Guides that I designed. Here's her photo so you can see what she looks like. Katt Z. is definitely a "pretty" witch. 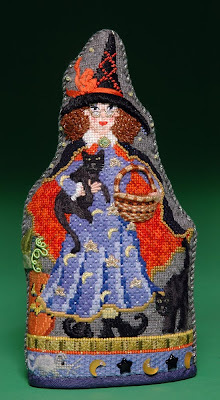 She is holding a Cat and there is a 3-D Woven Basket inspired by the techniques from DVD #7, The Ins & Outs of Needleweaving. There is another Cat by her side. Look who just spotted the Rat in the border. Now that's the beginning of a good story. The Pumpkin uses DMC Memory Thread for the Vine, and the Leaves are Picot Needleweaving; another technique from DVD #7. 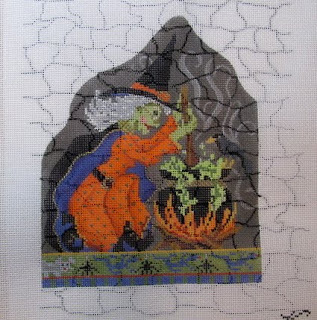 It was a wonderful experience to stitch Katt Z. Witch and develop her Stitch Guide. 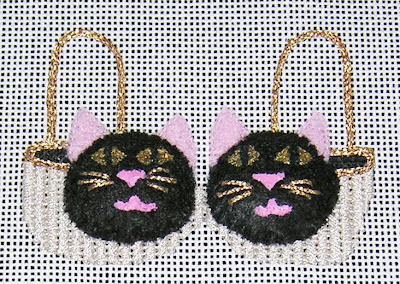 Shop Owners and Retail Customers can email me creativecats@comcast.net to purchase this Stitch Guide. Katt Z. Witch is one of Kelly Clark's Halloweenies characters; just not one of the "chosen" Halloweenies Home Study characters. Her number is KCN 9125. Well, thanks for your time. I've got some more stitching to share with you. I did finish basketweaving the Pears on my brick cover, but now I have decided to work on my Roo Bear Home Study. He is so cute and has been in a drawer for to long. So I will work on his head until I start Stirha Cal-Dron. It will be basketweave and some Reverse Scotch. I have loved stitching while the Olymics have been on. But I've got to share with you the wonder I have about some of these "sports". Many of them are life threatening. What's up with that! Another note on needles. If you have them available to you, try the Bohin needles. I simply love them and use nothing else. And some of you will be getting your next kit very shortly thanks in part to it being a leap year. I am going to wait and start this first Halloweenies character with you on the first of March. MARCH!!! Can you believe it! As we wait for Stirha Cal-Dron to arrive at our doors, I want to give you a heads up on the needles you will need as we continue Halloweenies. Along with your usual Tapestry needles, you will need a #24 and #22 Chenille, a #8 Embroidery needle and a #5 Milliner's needle. I went thru my needle box and found the Chenilles. I purchased an assorted set of Milliner's. I know I have a some embroidery needles somewhere. If I start looking now, maybe I will find them before I get to the section that uses them. 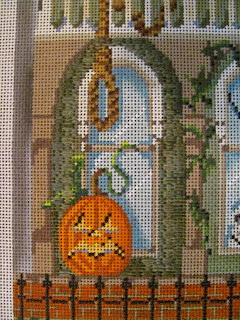 I was concerned about stitching over the stem of the pumpkin on the second floor just to the right of the ghost in the double window on the Haunted House canvas. I can confirm now that we should stitch over that stem and all pumpkin stems on the canvas. Hi Everybody ... Robin here. 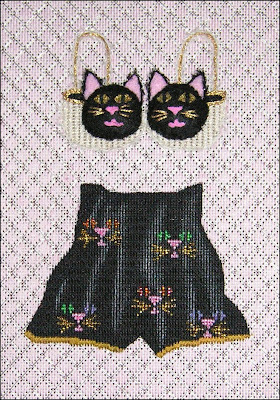 Thought I would sneak in & show you my finished Kitty Bra & Tap Pants. I really had fun stitching it. My inspiration came from Jane/Chilly Hollow and her Camouflage Bra & Tap Pants. I was reminded that I, too, had a Bra & Tap Pants in my stash. I loved the impromptu freedom of joining Jane. It wasn't planned... not even on the radar. It was an honor to receive nice comments from Sharon G, too. Now the dilemma... what to do with it? Any thoughts? Meet Ms. Stirha Cal-Dron. She is all dressed up in her fancy duds and making a brew/stew for us to enjoy in a matter of days. Look at the hair, the beads, the logs, the little eyeglasses. Kelly and Amy have done it again. Enjoy the view! Here is what I will be working on until we start stitching Striha Cal-dron. 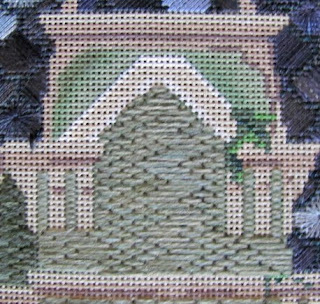 This is one of those projects that you can visit anytime for some nice basketweave stitching. Amy has suggested a stitch for me to use in the green background. 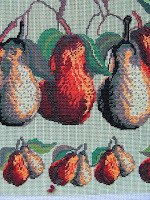 I am almost finished with the pears, (with Vineyard Silk). Then on to the leaves. I haven't decided if I will use a special stitch on the leaves. I will probably use stranded silk. Isn't it fun to look at a canvas and say...I will use silk here, wool there, ribbons here and perle there. The longer we stitch the more creative we get. Then sometimes there is a canvas that is just for relaxation and basketweave is the stitch of choice. And why is it we, (I), have several canvases that could be finished in just a few hours, yet I will turn to a new one, or even another one that is "in progress". We had this discussion today in the shop with several customers. It is like we can't say good-by. Or we don't want to make a finishing plan. 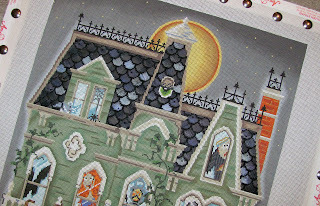 The haunted house is so much fun to stitch. I can't seem to get anything else done! Here is a little tip that has helped me with compensating around interrupted areas of siding. For instance, when you have to move from one side of a window to the other just go ahead and stitch out of sequence and carry the pattern over the window to the other side with just one vertical row. 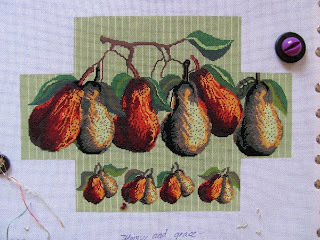 Example: with the giant florentine variation I would stitch 4,4,8,4,4,8 until I get to the other side and then continue with the horizontal rows as before. Hope this helps someone. Hi, everyone - I finished the large left section of the second floor this evening. It took longer than I expected to get a rhythm going and it seemed as though every time I picked up some speed there was some compensating to do and then I would get confused as to where I was in the pattern. I finally realized I needed a vertical reference for stitches in addition to the horizontal rows that I was stitching. So, where I could I would stitch a vertical line of stitches - long, short, short, long - for my vertical reference point. I hope that makes sense! I think the next sections will go a little more quickly - mostly because I learned a lot in the larger section and also the next sections are smaller - yay! Love having the Olympics to watch (or listen to) while stitching. Peggy, I think your zigzag section of stitching looks just fine. No one would ever know that you hadn't planned it. Thanks for your update Melinda. Needlepoint Study Hall welcomes notes and comments from our Halloweenies Family. I surveyed the canvas and realized that I had not done the area below the all seeing eye. At least I didn't discover it when I was on my way to the finishers. I will do it tonight. Back to that dormer window with the weird person. I did the stitch provided at the top. But as I went down I got lazy and made up a zig-zag stitch. I think it will work alright. I probably should have waited for the light of day to stitch it. I know I am way ahead of most of you guys. So I invite you to comment on your progress. I am deciding what to work on for the rest of the month. I will share that with you too. Keep Stitching. I am pleased with my strategy, (Amy's Tip), to stitch the lightest thread combination down the center of this section of the Haunted House. I stitched the darker colors as I moved out to the windows. It really gives it a weathered look. I also played with the color on this edge of the house. I think it will look great when we add the ivy around this area. It adds a level of fun to play with the color. Each house will be unique. But don't get bogged down playing with color. The characters in the windows will be what pops out. As I stitched the area behind the railings, I just stitched whatever color came naturally out of the skein. I can't wait for you to see the railing that Amy has created for us. We've still got two weeks to finish this part of the house. Just stitch a little every day. As we move into this weekend, hopefully more people will be moving on to the walls of the Haunted House. I can't stress how important it is to break the work into sections. That's the only way I could look at it without feeling overwhelmed. There's a lot of house to stitch. I urge you to needle up say six needles with each combination of threads. It is so much easier to just tie off and slip the new needle in where you have just left off. Plus it makes it easy to change color combinations as you approach areas where you would like the threads to be darker. Does that make sense? I have had a few arguments with the Lorikeet. Remember Amy's tip in the directions. And that's another reason to go on and strip a lot of Lorikeet at one time. Grrr. Make sure you understand that each story of the house has a different stitch. It would be so easy to mindlessly repeat a pattern all the way to the roof. Not that I think that any of you are "mindless"! I love the shading of the overdyed thread we are using in the Haunted House. I wanted to control the light and dark areas on the house. So on the right side of the second story I put a row of the lightest color combination down the center between the windows. Then I will work out to the edges, trying to place the darkest threads on the edges. I will let you know how it turns out. I have done the wall behind the rails of the balcony. Don't stitch over the heavy posts as I did. I caught it quickly. I like the way Amy has broken down the sections in the second story. I did the middle sections first as we don't have to worry about shading there. 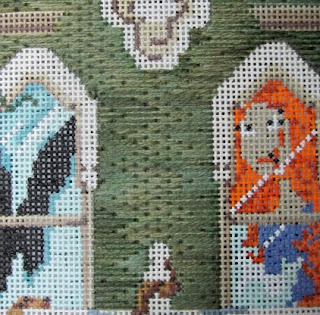 The shading really comes in when you stitch the other sides. So I stitched the center area for the 2nd and 3rd floors in perfect mindless bliss. After all, Bargello was my first love. I like the way Amy has changed the stitch on each area a little too. It gives the facade some character. I referred to one of the extra pictures that came with the guide a lot. Amy included just enough of each section to be of help to us who need more direction. It's just reassuring to know you are on the right path. So how is everyone coming along? I've added the Pink Background to the Kitty Bra and Tap Pants. I'm calling this Phase 1. Why? Well, because upon further review... I thought my "barely there" background needed a little bit more zing. I found the perfect Phase 2 candidate: Hi-Lights. I'll keep you posted. Memphis has snow! When I woke up this morning it was very quiet and very bright. I knew something was up. Yes, we have a couple of inches of snow. Amy sent her dog Baxter out to confirm the existence of the white stuff. While I LOVE working at the shop, I HATE driving in the wet stuff. So I have a grown-up snow day. And what do you think I will do today? I am going to repeat the comment I made on the last post so everyone will get the message that I/we think the best starting point for the green areas around the lower windows of the Haunted House is the section with the spider. 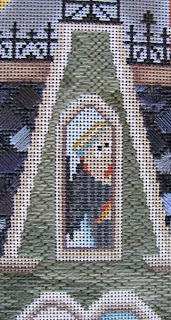 It lets you set the stitch and the shading in your head before you get to the narrow areas. Thanks again to Melinda for sharing her tip. I must admit that I sat and stared at the first window at the bottom of the Haunted House for about 15 minutes wondering just where, EXACTLY, do I begin. I finally decided to start in the middle of the leftmost window frame where I could get a good run of the full stitch. I put my waste knot at the bottom and worked down. Remember we are going to stitch over the greenery associated with the pumpkin. You don't have to start where I did. It just made sense to me. If anyone has another starting tip, please pass it on. With that start, now all I had to do was continue, compensate, and look for color placement. I referred to one of the extra pictures that came with the guide to make sure I was traveling around the top of the window in a manner somewhat like Amy did. This is not a "mindless" stitch because of the color changes. But I got thru it. So finally I finished the entire first window. I am feeling pretty confident that I can now whip these window frames out quickly. Please do pass on any tips or tricks you think might help us all. I am by no means an advanced stitcher. So I am not your teacher, just a fellow stitcher. I daresay that we will all be more advanced stitchers by the time we finish this project! I had promised myself that I would not post pictures of my pets. But Ethan finally figured out that I was taking pictures, so he posed for me. How could I deny his quest for fame? Alas, he has no tips for us. He just sits and watches my needle go up and down. It's time for the Big Reveal. Here's my 3-D Kitty Bra. There are 3 layers of Black Felt making the Padded Face, and there are Pink Felt ears, too. DMC Floss was used for attaching both sections. 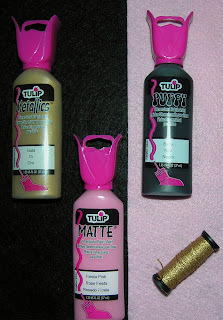 The Pink, Black and Gold Fabric Paints were applied. The Kreinik Braid size 12 finished out the Whiskers. It's whimsical and flirty... everything a Kitty Bra should be. Next up? The Background and a lovely shade of Pink. 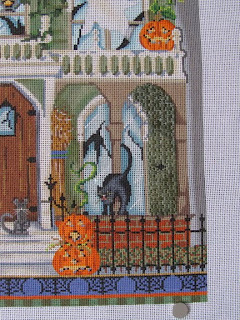 I am getting reading to stitch the front of the Haunted House. The principle thread for this is Gloriana Lorikeet. This is a variegated wool and is produced in a wide range of colors and hues. 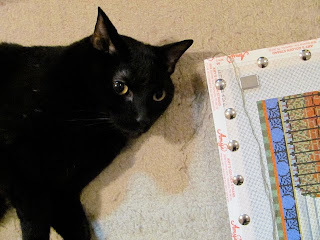 I've seen Amy use it for bargello patterns and it works up beautifully. I want to share Amy's tip for stranding this thread, as it is unique. If you are participating in this home study you already have this tip. But I would like to share it with followers and encourage them to purchase some and try it in a project. So here it is. "(The) Lorikeet can be hard to strip. It is 9 strands of 100% wool and can be slightly felted in the overdying process. On the first 2 or 3 strands to be stripped out of the group, pull about 3" - 4" out of the bundle and then straighten the thread. Repeat this short stripping process rather than trying to pull the entire strip out without straightening or you will get a tangle." So the front of the house will be like the roof in that it is based on the design and stitch diagram Amy has given us. But you can use your own judgement and creativity when placing some of the light or dark green threads. What this also means is that there is no wrong way to create you house. Each one will be unique to the stitcher and the dye lot. So get both sets of threads needled up and begin. It helps to turn your canvas 1/4 so you can more easily lay your threads. If you haven't been using a laying tool up to this point, this will be an excellent way to learn, as the front of the house requires us to lay two threads side by side. You can use a BLT, (best laying tool), or a very large needle or pin. Read more about the BLT here. Don't get overwhelmed. Just take one window at a time. It's time to reveal my intentions for the Kitty Bra. 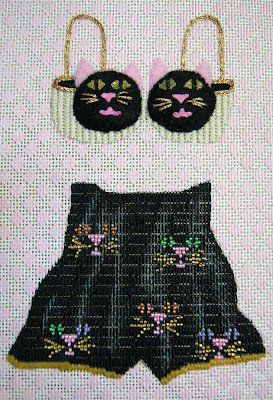 Jane from Chilly Hollow guessed correctly: I'm going to make a 3-D Kitty Bra. First, I made a paper copy of my canvas. (I know you know you should always try to do this.) 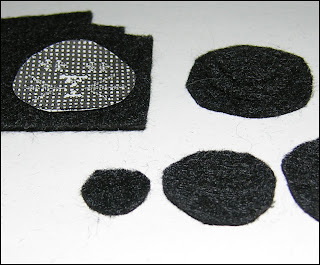 Then I cut out 3 circles of Black Felt using the Face Paper Pattern as a guide. Two of the felt circles were cut even smaller. I stacked them and the largest piece was the actual Kitty Face on the Bra. Next challenge? How to create that sweet Kitty Face detail? Originally, I considered beading the face detail, but I didn't want anything to compete with the beaded Tap Pants. Next, I considered embroidering the Face detail. Still not the right answer. The felt weave was not tight; the embroidery stitches created holes from over-use. Can you sense my approaching sick feeling? I had taken on this project ... the entire blogging world was looking on! Two failed attempts. I was ready to press the delete button, pack up my things, and return this wonderful blog back to Peggy. Hi Everybody... Robin here. I've been working on the Kitty Bra & Tap Pants; I'm pleased with the progress, so far. My last blog entry inferred there might be a "cover up" brewing regarding the Kitty's Face. Will there be a mask or a veil? The first canvas of the Halloweenies series is quite large. It would be easy to get overwhelmed. The good thing is that Amy has broken it down into segments for us. We can just concentrate on the one little area we are working on. I took that a step further by breaking down the roof shingle areas into three segments. First I concentrated on the area on the left. I decided how many eyelets I wanted to make in that section only, which shingle to put them in, then what colors to make the eyelets. I stitched those first, then did the rest of that area. Then I worked just in the panel with the eye. (Can't wait to see what we do with it.) Again I decided how many eyelets and what colors for them. Then the others fell into place. And finally I worked the remaining skinny sections on the right the same way. I plan to do that with the front of the house as well. It really helps me not get overwhelmed. I hope more little coffins arrive at your doors today!